Part of their pitch (some might call it laying bait for the more gullible fish in the pond) is to throw a few grand at the local footy team (new jumpers all round) or theatre group (new curtains and lights); or wombat preservation (see our post here). STT has pointed out just a few times that the wind industry is little more than the most recent and elaborate Ponzi scheme in a list that dates back to “corporate investment classics”, like the South-Sea Bubble and Dutch tulip mania. In the wind industry, the scam is all about pitching bogus projected returns (based on overblown wind “forecasts”) (see our posts here and here and here and here); claiming that wind turbines will run for 25 years, without the need for so much as an oil change (see our posts here and here and here); and telling investors that massive government mandated subsidy schemes will outlast religion (see our post here). In the first of the above, we pointed to the efforts of Simon Holmes a Court to build an “empire” around 2 clapped out Suzlon/REPower 2MW turbines speared into Leonard’s Hill, using money siphoned from 1,900 gullible, greentard ‘investors’. That community calamity (see our post here) kicked off in 2011, but has yet to return a single cent to investors in that time. But, hang on a minute? Whatever happened to all that ‘love’ for ‘clean, green’ power – that’s said to drive power consumers to lap it up with a fork and spoon – and all that talk about wind power being ‘free’? Surely, there couldn’t be a safer bet for anyone looking to grow their rainy day savings? German ‘investors’ in so-called ‘community wind farms’ are licking their wounds, as their operators rack up cumulative losses in the tens of €millions. The FDP Free Democrat party in the state of Hesse (central Germany) writes in a press release how local utilities and communities are suing wind park development company JUWI, accusing it of “making unrealistic promises” regarding wind energy projects, and calls them “highly speculative business with enormous risks for public budgets“. Over the years German local utilities and communities have invested tens of millions of euros in local wind parks with the hopes of seeing a ruddy return on investment and making a noble contribution to climate protection at the same time. That dream, it is turning out, has shattered. WIESBADEN – Once again wind projects are producing negative headlines. In the spotlight is “wind energy pioneer” JUWI, which is one of the largest project developers in Hesse. With the Pfalz City Utility and the City Utility of Mainz, two large community electric utilities are suing currently JUWI because the wind prognoses made never materialized, and thus the returns fell way below the planned budget. Instead of posting profits after more than ten years in operation, community company “Pfalzwind GmbH“ has seen double-digit millions in losses. Pfalzwind operates more than 60 turbines. ‘We see the same result in Hesse as well. Everywhere communities, utilities and energy co-ops were lured by large profits, but in the end most wound up with losses that the citizens will have to cope with. Not only are they stuck with damage to the environment and the landscape, but now they also have a financial disaster to cope with,’ says René Rock, energy policy speaker of the FDP faction in the Hesse state parliament. ‘The lawsuits by the community utilities once again show that promises made by the wind industry are unrealistic. 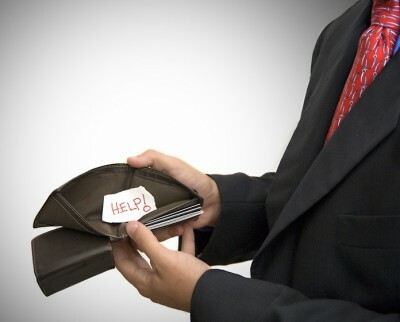 And due to the falling feed-in rates, the economic prospects are worsening in addition. 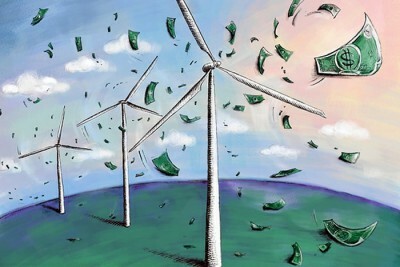 Also large utilities in Hesse, such as Mainova AG in Frankfurt, are losing money with their stakes in wind parks. And never mind the industrial blight and environmental destruction they are causing to Germany’s once idyllic landscape, and the threat to human health and wildlife. The selling techniques of this industry have been utilised to the highest degree and illustrates just how gullible people can be, even well educated people. If there appears to be money in it they fall for it. Others of course are ideologically challenged and will believe anything as long as it looks as if it will fit into their beliefs and desires. People who fall into these two groups will never accept they are/were wrong in putting their faith and/or money into foolish things which a little thought, research and intelligence would tell them are nothing more than money hungry seekers working on ‘pie in the sky’ dreams of others, to achieve their own ends. The world too is losing €trillions on intermittent unreliables that which requires 24/7 fossil fuel backup…..?! The folly of green madness gone incredibly wrong.